Klout is only as good as the networks you provide. This is why Klout continually improves its service by offering more networks to connect and ways to interact with your influencers, such as giving +K endorsements. 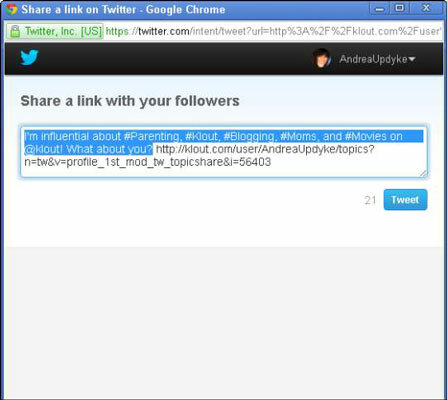 You may use the Facebook and Twitter Share buttons located in your profile to compose a tweet about Klout. For example, you can click the Facebook or Twitter Share link below your list of influencers or your list of topics to share some of your influencers or topics of influence with your friends or followers. They then have the option to click the link and join Klout. 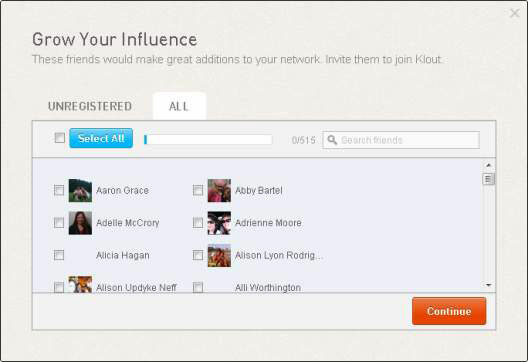 Because you are already connected via Facebook or Twitter, new Klout members are added to your influencer list when they join Klout. Klout has integrated Facebook invitations in a few different ways. If you would like to use your Facebook account to add friends to Klout, you can use one of the following tools. 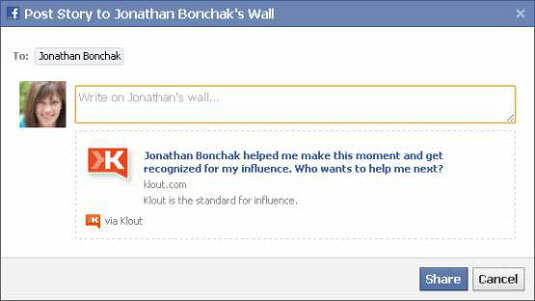 With your Klout profile page displayed, notice the blue tab labeled Add Friends in the bottom-right corner of your browser. This Add Friends tab remains in the same place even as you scroll the content of the page. Click it and you see the Grow Your Influence dialog box. Notice the two tabs at the top of the box marked Unregistered and All. Unregistered: By choosing Unregistered, you have the option to invite only those Facebook friends who aren’t already connected to Klout. All: Selecting All also includes current Klout members. Select All: Selecting this check box selects everyone in your friends list to receive an invitation from Klout. Deselecting this box deselects everyone. Select individual friends: Your Facebook friends appear in a scrollable list alphabetized by first name. 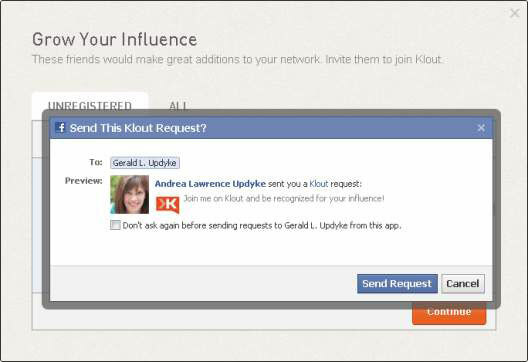 By selecting the check box next to an individual’s name, you are agreeing to send them an invitation to Klout. This option allows you to pick and choose who you would like to invite. Search friends: Next to the Select All button, you see a search field. This is particularly useful if you are looking for one or two friends to invite and you don’t want to scroll through your entire friends list. Start typing a name into the search bar and select the check box that appears next to your friend’s name to invite. After you have made your selections, click the orange Continue button. This opens another pop-up screen that contains your Facebook authorization and a preview of your invitation. If everything looks the way you want it to, click Send Request. You then see a notification on your screen that says Invites Sent. Click the x in the upper-right corner of the pop-up box to exit the screen. 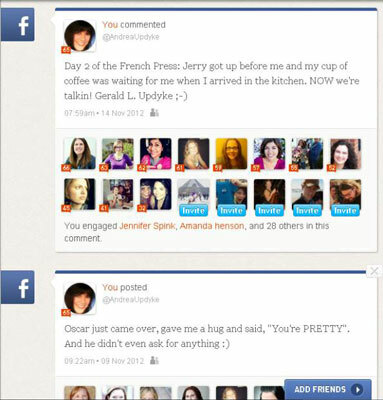 While looking through your various Moments in Klout, you see avatars for your friends who engaged with your post. If your friends are already Klout users, you see their Klout Score overlaid on their avatar. However, if they are not yet connected to Klout, a blue Invite button appears on top of their avatar. To invite a friend from this screen, click the avatar of the person you wish to invite. This creates a post that appears on your friend’s Facebook Wall (Timeline). In the pop-up box that appears, you may customize the message if you wish. Click Share to invite your friend and return to your Klout page.